A BBC Watchdog investigation has found Virgin Media customers across the UK are receiving only a fraction of the broadband speed they were promised. It found the company had been signing up too many customers in some areas, leading to issues relating to "over-utilisation". Some customers were receiving just 3% of the speeds promised, it said. 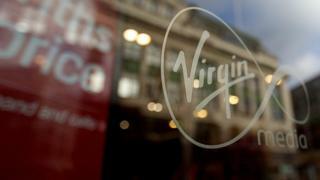 Virgin Media said it was "disappointed" that it "fell short" of its own high standards on broadband speeds. Chief executive Tom Mockridge said: "We apologise for the inconvenience to these customers and have resolved the issues they raised. "All of our sales agents have been re-briefed on the company's sales policy, and we are providing additional training to ensure everyone complies with it." Virgin Media has not confirmed the exact numbers of affected customers. Virgin Media customers in the affected areas were struggling to complete tasks such as streaming video, listening to music and downloading games, despite paying for speeds of about 200Mbps, Watchdog found. At the end of May 2017, Mr Mockridge said 100Mbps would now be the "broadband standard" for the company and the industry needed to improve the way it advertised speeds, so customers were not "hoodwinked". The BBC Watchdog investigation into Virgin Media is broadcast on Wednesday, 5 July, 20:00, BBC One.